Please note that, unfortunately, we no longer accept reservations of only one night. Rooms are reserved with one-half the total charge. One night stays must be paid in full in advance. 1. Your Master/Visa card number. 3. The three digit security code on the back of the card. 4. A note giving us permission to debit your account for one-half the total cost. 5. Please acknowledge that you have read and accept our cancellation policy. Please scroll down to our Cancellation Policy at Rates & Info. Please note: One night stays must be paid in full in advance. Our telephone and fax number are the same. To send a fax, press the Send button when the line is answered. Since we accept no walk-in business, a cancellation policy is necessary in order to create a secure and private world for our guests. 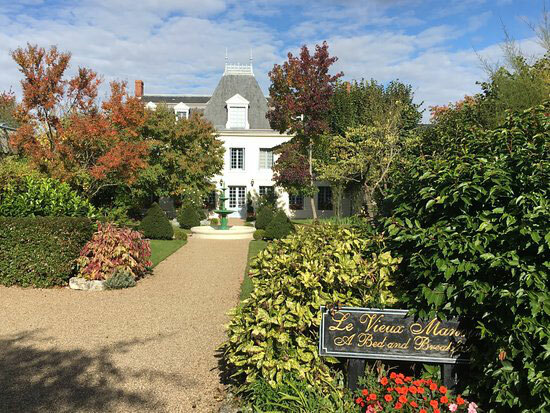 For the Manoir: A refund minus a charge of 25% of the deposit will be made up to one month before the date of arrival. After that date the deposit is forfeit unless we rent the room. If we re-rent the room, the total deposit is returned minus a 5% handling fee. If guests must leave early for any reason, they are responsible for the balance due and reservations dates are not transferable. For La Maison de Gardien and La Maison de Portail: A refund minus a charge of 30% of the deposit, will be made up to two months before the date of arrival. After that date the deposit is forfeit unless we rent the cottage. If we re-rent the cottages, the total deposit is returned minus a 5% handling fee. If guests must leave early, for any reason, they are responsible for the balance due and reservation dates are not transferable.